With the state basking in a growing economy and budget surplus, the New Hampshire Fiscal Policy Institute took “Investments to Sustain a Vibrant Economy” as the theme of its sixth annual conference on Feb. 22, drawing some 150 representatives of government agencies, nonprofit organizations and businesses to the Grappone Conference Center in Concord. Among the New England states, only Massachusetts has enjoyed greater economic success than New Hampshire. Jeffrey Thompson of the Federal Reserve Bank of Boston, the keynote speaker, drove that point home, noting that growth of real gross domestic product per capita and non-agricultural employment in New Hampshire has trailed only Massachusetts among the New England states while its unemployment and poverty rates are the lowest in the region and among the lowest in the country. Likewise, Phil Sletten, policy analyst at NHFPI, reported that median household income, after dipping from its peak of near $73,000 on the eve of the recession, began climbing in 2014 to return to its prior peak by 2017. However, in keeping with national and regional trends, the real wages and salaries of those with the lowest incomes fell more sharply and rebounded more slowly than those of their most affluent counterparts, returning only to the levels of 2005 by 2017. By 2017, one in three New Hampshire households were left with incomes of less than $50,000 and one in five with incomes of less than $35,000. And while the numbers receiving food stamps have fallen from their peak of 120,000 in 2013 to 80,000 in 2018, more than a third of them are children, twice the total enrollment in 2002. Sletten noted that the Massachusetts Institute of Technology Living Wage Calculator estimates the budget for a household of two working adults and a child in New Hampshire is $58,160 while the Economic Policy Institute sets the figure at $69,718. Sletten explained that as the New Hampshire economy recovered and grew, state revenues also stabilized and expanded. Since 2014, they have outpaced projections to yield increasing surpluses. At the same time, the state reduced aid to school districts and municipalities to cope with the fiscal pressures arising from the recession. Education aid has shrunk since 2011 and stabilization grants, which are targeted to property-poor districts and represent a quarter of all state aid, have been trimmed and are being phased out. State aid to municipalities, which topped $180 million in 2009, fell to $110 million by 2013, as state revenue-sharing was cut by a third and the state withdrew its contribution to the pensions of police officers, firefighters and teachers. These fiscal policies have contributed to a steady increase in the aggregate tax commitment, which rose from $3 billion to nearly $3.5 billion between 2009 and 2018. 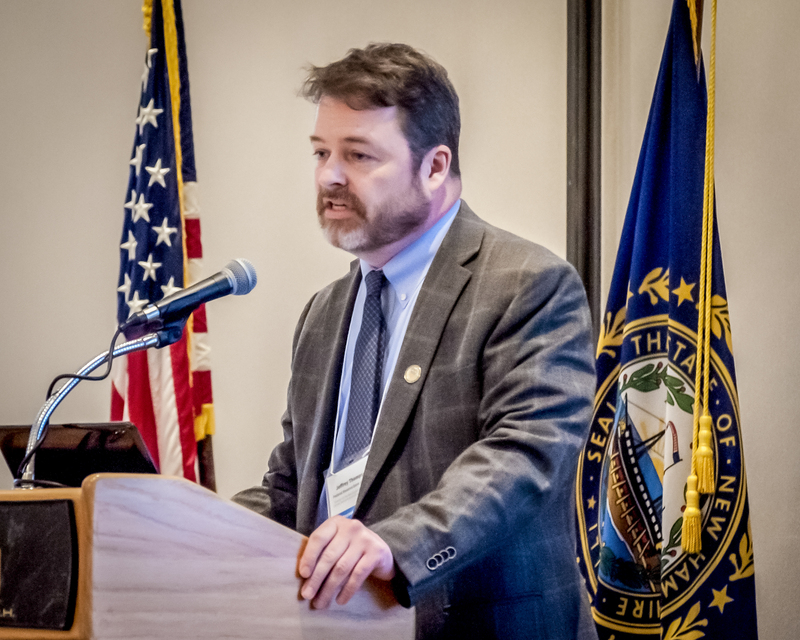 His remarks resonated when Jeffrey Myers, the current DHHS commissioner, began a panel discussion by stressing forthcoming investments to restore the state’s distressed mental health system, strengthen protections for children at risk of neglect and abuse, and marshal resources to overcome the opioid crisis. Myers said that all were high priorities shared by the governor and Legislature, adding that surplus funds provided “a unique opportunity” for investment. In January, Myers released a 10-year plan, the second in the last decade and the first with programs specifically for children. The plan pursues the major recommendations of its forerunner issued in 2008, which were eclipsed by the recession and opioid crisis. 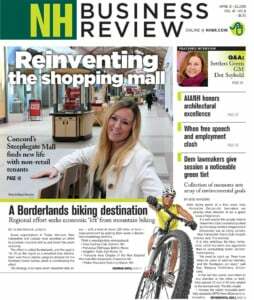 Assessing the state’s economic prospects, Thompson pointed to signs of slowing growth in the region, while noting that New Hampshire, with its budget surplus and reserve fund, was among 14 states — and alone in New England — at little risk of fiscal distress in a recession. With a series of maps, he portrayed the state’s economic prosperity and population growth, which is largely concentrated in the southeast quarter nearest to Boston. Without saying the word “railroad,” he suggested enhancing connections to New England’s dynamic metropolitan economy and extending them throughout the state. Thompson singled out the tight housing market, high cost of higher education and aging population, which together contribute to a straitened workforce, likely constraining on future growth. Dean Christon, executive director and CEO of the New Hampshire Housing Finance Authority, said that with two to three months of inventory, the supply of housing is extremely limited and the median price of $280,000 is beyond the means of homebuyers with less than $90,000 to $100,000 of income. In the rental market, vacancy rates have dipped below 3 percent, which represents normal turnover, and rents have risen faster than incomes. Single-family housing starts have fallen to about 2,000 a year and multi-family construction to half that. While Christon acknowledged the role of the tight labor market and rising material costs, he emphasized land-use regulation and permitting processes served as disincentives, adding to risks and costs of development. According to Thompson, the cost of higher education in New Hampshire is the highest in New England. Three-quarters of the state’s college graduates — the largest proportion in the region — leave owing an average of $34,415, the fourth highest burden in the country. Also on the panel, Ross Gittell, an economist and chancellor of the Community College System of New Hampshire, stressed that the higher the level of education, the lower the rate of unemployment and the higher the weekly wages. A study undertaken for the community college system found there were 9,522 job openings for 5,531 candidates with associate, bachelor’s or higher degrees, while 13,380 job seekers without a higher degree were chasing 6,132 job openings. “Demography is destiny,” Gittell said, “only if you let it be,” stressing the importance of affordable and accessible post-secondary education. Kristin Smith, family demographer at the Carsey School of Public Policy at the University of New Hampshire, called attention to the widening disparity of wages and incomes and stressed the importance of supportive services in enabling families and individuals to fully participate in the workforce and pursue educational opportunities. In particular, she highlighted the high cost of child care, estimated at nearly $9,000 a year, which hinders the ability of parents of young children to secure and sustain further education or gainful employment.